Is John Wall's time up in Washington? "They'll surely have to consider blowing up the roster this year is they can't go on a run. 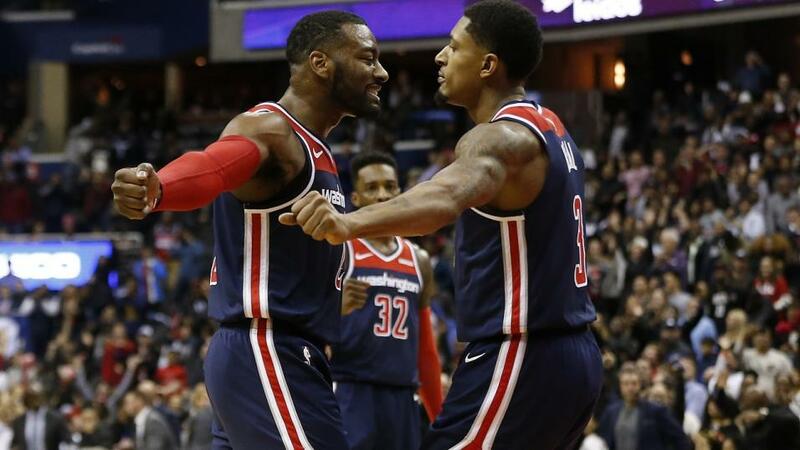 Wall's contract is punitive, but some team will be desperate enough to do a deal for his talent, and Beal is a genuine trade asset, so they could start to turn things over this season if they can't build back towards .500 and playoff contention." For a few years, Washington convinced themselves, if no one else, that they were the match of the LeBron James' Cleveland Cavaliers. The only problem was they could never stay in the playoffs long enough to test King James, let alone prove it. He's gone now, so the field is open for a team like the Wizards to emerge in the East, but their first and second round postseason exits look positively stellar at the moment given the start John Wall and Bradley Beal have seen their team make. They're 8-12 after opening 2-9. They've picked up a few big wins in recent weeks over good teams, knocking off the Clippers, beating the Rockets despite 54 points from James Harden, and taking out tonight's opponents last week in DC. That shows there's still some fight in Scott Brooks' team, you just never know when it'll show up. They'll surely have to consider blowing up the roster this year is they can't go on a run. Wall's contract is punitive, but some team will be desperate enough to do a deal for his talent, and Beal is a genuine trade asset, so they could start to turn things over this season if they can't build back towards .500 and playoff contention. New Orleans need to look like challenger this season too. 10-11 is not where they'd want to be, but they've flashed potential. Their fortunes almost directly correlate with Anthony Davis' health. When he's fit, they win, when he's not, they don't. The Wizards visit NOLA with Davis playing through a hip complaint. The Pels have lost four straight, including all three on a northeastern road swing that saw the Knicks and Wizard take wins. Both of these teams are generally high-scorers, and that's reflected in the total line of 240.5. With Davis hurting, these two scored 238 last week, so if he's healthier, it should add up to more scores, and the trends generally suggest this high number is within the reach of these two teams. We'll take the over at [1.94] with the second and third worst defensive teams in the league. This game is a chance for us to test some early season impressions. One good team has hit a bumpy patch, while their overperforming opponents can show if they're for real or not. Portland's troubling run started on a recent road trip. They took a 43-point tonking in Milwaukee last week, and followed that up with a 28-point loss against a struggling Warriors team without Curry and Green. Losing to the Clips in their last game by four is no disgrace, but they need to get back on track or this could become a crisis. Enter the Magic. They've brightened the opening weeks with some dazzling play and suprise wins, but I'm not sure many expect them to sustain it. They're 8-2 against the spread in their last ten, which shows they're playing some of the league's bigger names close. By contrast, Portland are 1-6 in their last seven on the handicap, but that includes a six game road trip against some very tough teams. They're much better on home court, playing LA close suggests they're getting back in their groove and they should cover the -7 at [1.91] as Orlando plays the fourth game of six on the road. Somehow the Clippers are the top team in the West right now. They have five players averaging double-digit scores per night, which helps. Tobias Harris is leading the team like a superstar, and it all makes a refreshing change from the doom and gloom that accompanied the post-Lob City era. Whether it's sustainable is another question. They've had a relatively favourable early season schedule, and their hodge-podge roster has been put together because these players haven't maintained a high level elsewhere. They take on the Suns tonight, and should be able to add another win to their record. Phoenix are 4-16 this season, and 8-12 against the spread. They come to the Staples Center from a home loss to Indiana last night. This is a big line, and the Suns have shown themselves resilient against double-digit spreads, covering in all but one this season, including a 13.5 point cover on no rest against the Thunder early in the season. Still, the Clippers are playing so well at the moment it's hard to rule them out covering here, even if they haven't been asked to take care of this high a number all season. All of which make the over more appealing on the total. Both of these teams are tending towards overs, with LA hitting the target in seven of their last eight games, and neither plays great defence, so 228.5 at [1.91] looks within reach.